This feature was inspired by a question I was asked during an interview I did the other day for the Dunfermline match-day programme; who’s the best player I’ve ever played with? It was a really tough one, but my answer was Lars Zetterlund, a Swedish midfielder I was lucky enough to have played alongside for Dundee United 15 years ago. This got me thinking about former teammates who were not only brilliant players that made an impression on me when I was a youngster, but also those who were talented individuals and great characters in the dressing room. Each week I’ll try to feature a different player and give you some information that you definitely won’t find on their Wikipedia page! To get us started, this first post is about a Dundee United legend and someone I bumped into when we played them recently in a friendly – Dave Bowman. He’s now a youth coach at the club where he had his most successful spell as a player. In the 80’s and 90’s, ‘Bow’ was a tough tackling midfielder who could also pass the ball but fans will remember him as a player who didn’t take any prisoners. 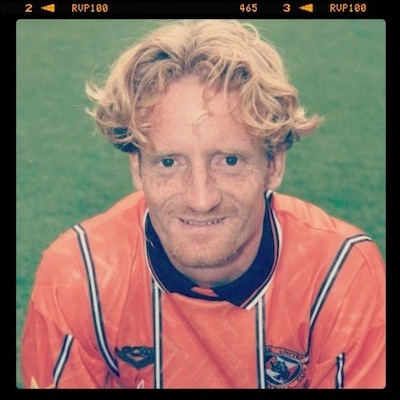 His uncompromising style earned him the nickname ‘Psycho’ among the Tannadice faithful with his determination and will to win making him a firm favourite with the United fans to this day. 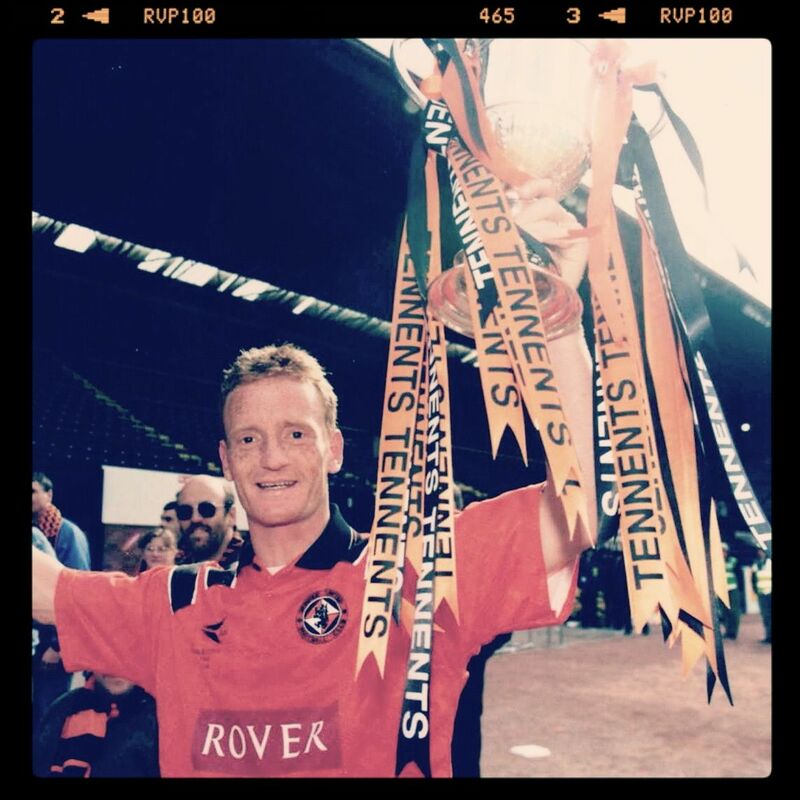 He was a member of the Dundee United side that lost to IFK Gothenburg in the final of the UEFA Cup in 1987 and he was also a Scottish Cup runner-up three times before finally getting his hands on the trophy after defeating Rangers in the 1994 final. I partnered Bow in the centre of midfield a number of times during his final season at the club and at 34 he was one of the fittest and most determined players I’ve come across in my career. I made my breakthrough into the first team that year and he was one of the experienced pro’s who took the time to help myself and the other young players. Oh, and he terrorised us as well because he was totally mental! To be honest, it wasn’t just us, anyone at the club was fair game for Bow. He loved nothing more than playing practical jokes on both players and staff and if anyone tried to take retribution, he would retaliate further by taking it to another level entirely. He was at his most dangerous when he was injured and had too much time on his hands. On those days we would come back to Tannadice after training and you could almost guarantee that someone’s clothes would have been tampered with, either ending up in the showers or in the bin cut to shreds. He also enjoyed having ‘banter’ with the cleaning ladies Rose and Ann. One day we returned to find Rose, stuck in a bin with her legs and arms sticking out the top and Bow trying to roll her down the corridor. Another time we found her inside one of the industrial dryers in the kit room with Bow threatening to turn it on, just for a laugh. I know this might sound harsh, bordering on harassment but it was hilarious and wee Rose was a great sport. Unfortunately I didn’t manage to escape the wrath of Bow but I’ve got to admit I did bring it on myself. When Stephen Thompson and I were cleaning out the mini-buses we used to go to training, we thought it would be a good laugh to brush all the grass and mud onto the bonnet of Bow’s car. He’d parked it right up against the back doors and it was too good an opportunity to miss. We thought we’d gotten away with it after moving the bus before he went home but all he had to do was look at the sheet on the notice board to find out who’s job it was to clean it so it wasn’t the brightest idea. Two days later he got his own back in spectacular fashion. We were staying at a hotel in preparation for our UEFA Cup tie against Trabzonspor and committed the schoolboy error of leaving our bedroom window open when we left for dinner. Like a ginger ninja, Bow slipped away just before the end of the meal and when we got back to our room to relax for the night we opened the door to absolute carnage! The beds were upside down and mattresses stuffed into the bathroom, the curtains were hanging off the rails, all our clothes were soaking wet in the bath, lightbulbs were gone from the lamps, and if all that wasn’t bad enough, he’d eaten all of Tommo’s sweets and left the empty wrappers just to rub it in. After taking the whole night to tidy the place up, we thought we’d watch a bit of telly before bed only to find out that he’d stolen the batteries for the remote. We’d had enough by then so we just hit the sack, but we got one more subtle surprise from Bow just before bed. He’d gone to great lengths to fill my toothpaste with shower gel which quite literally had me foaming at the mouth! Despite causing absolute mayhem wherever he went it’s a sad thing that there aren’t many characters like Bow left in the modern game. He’s a one-off, a great guy and a I’m honoured to have played with him. Dave Bowman, I salute you, you madman!